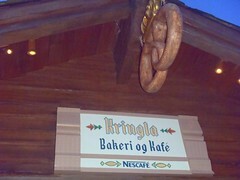 Pretty much the only thing we did in the Norway Pavilion was go into the Kringla Bakeri Og Kafe two days in a row. The first time was when we were leaving Epcot for the day and Mik thought we were going to just rush past the countries we were going to come back to the next day. However, I made him wait outside the bakery and got him all pissed until I brought out lefse. Then he was quite happy. The next morning we had to each get an order of lefse. 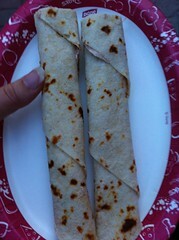 Mik and I both love lefse having grown up having it for holidays. A few years ago I started making it myself, but I still stink at it and last Christmas totally failed and ended up with none. I just cannot master rolling it out thin enough. 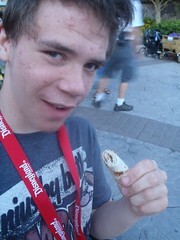 Anyways, the lefse at Epcot is totally worth the price when it takes me so much effort to make substandard lefse and it is actually a very affordable snack (~$2, I think) considering the price of most things at Disney World is expensive.